This was by far the least fun part of the entire project but still necessary unfortunately. 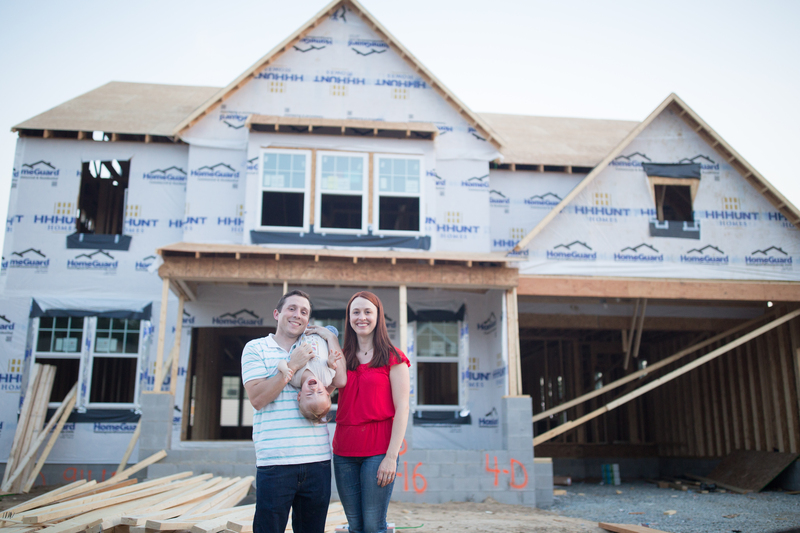 You might think, it’s a new house – how much prep work could there be? But see, that’s the fun part of new construction homes. They don’t make them like they used to. And though the materials are all new, there’s usually some amount of cutting corners. You never know what’s hidden – lurking behind that fat bead of caulk. The scariest part is of course the moment you start to dismantle your perfectly new kitchen. For us, this was ripping out the granite backsplash. I knew from day one it had to go but I still cringed and wonder if I went wrong when I saw the gaping holes in the drywall it left. 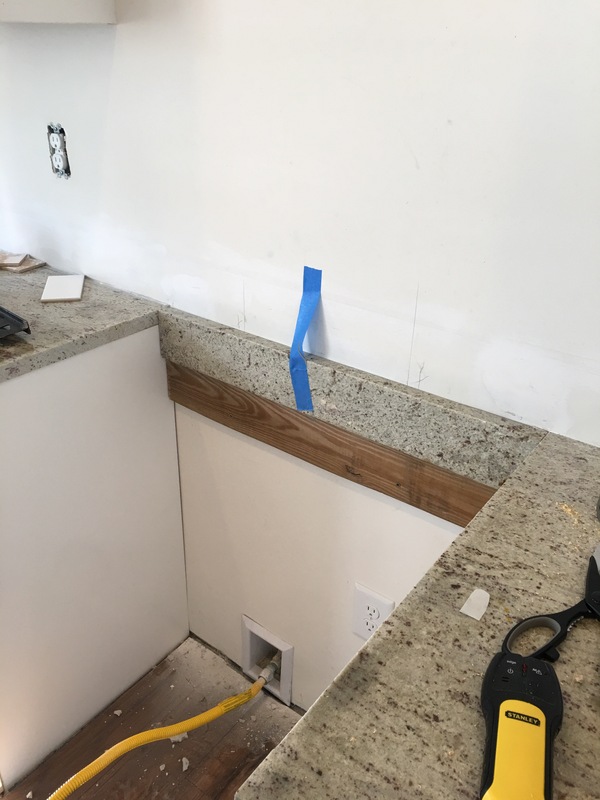 I had asked when we selected our options if we could simply not have the 4 inch granite backsplash installed and have the walls left blank but unfortunately they said there had to be a backsplash – whether that be tile or 4″ of the counter material. Now I realize they likely do this because of how the counters are (poorly) installed. Counters should almost meet the drywall so that when tile is installed there is no gap remaining for water, spills, etc. Our countertop maker, a reputable company in Richmond actually, installed each section of counter with the middle cut out and only the ends meeting the walls. They then hid this flaw with an inch thick of granite backsplash. This makes it easy on them installing if the walls are not level. Unfortunately for us it meant too large of a gap in some areas – like nearly 1/2 inch! Much wider that the width of any backsplash tile. I was left with the conundrum of how to close the gap. The best solution would be to add some coved tile along the bottom row which would look like a bit of molding to completely hide the gap. But I really wanted a flat, perfect surface. And what mama wants…but mama wasn’t about to have all new counters installed! So off to the google I went and the common consensus was caulk it. So I went in search of a light grey caulk. I wanted something that would blend with the granite as best as possible. I bought the lightest grey tile caulk that Home Depot carried (which annoyingly is not the same as the lightest grey grout they carry) and at $8 a tube I filled the gap for about 5 feet. But the color was too dark. I was worried it would match our caulk under the tile and look like the worlds fattest caulk line. Also, at the rate I was using it up I’d spend a fortune on it. Plus, caulk shrinks by 30% when dry. So I wondered if I’d ever be able to make it look level. I pictured it being a divot forever. So I scraped out a bit of the caulk and threw google to the wind. What do you know anyway tile experts? So I grouted it. I figured WTF…this stuff is supposed to be sealed. The nice thing about grout is it doesn’t shrink as it dries like caulk does. Although over time I am curious how it will look – it is sanded grout so I’m thinking that will help. It also was in stock in a light grey in a small pre-mixed tub. I think I spent $20 and it will definitely be enough for all the gaps. It has a sandy, textural quality that in a large gap like mine looks kind of like poured concrete. And I suppose you could say that’s a step towards granite. Ok it’s not granite. And it definitely doesn’t match my granite. But I figured if I got really annoyed with it I could paint it to match our granite better. But I’m just hoping hoping hoping that it will be barely noticeable. Now back to the actual removing of granite. I pictured it would be like removing trim. A little slice of the caulk and then a little prying and “pop” the granite comes right off. Ya, not realllly. More like hammer your crowbar deep behind the granite crushing your drywall, then pry with all your weight and repeat at every 1 foot. And then go back again at each point if needed. It wrecked the drywall. Damn silicone is some sticky stuff that does not want to come off granite. So it takes all your drywall with it. Fortunately, almost all of our major holes were easily fixed with some heavy spackle (about 3-4 coats, sanding in between coats). However we had one crater that was so deep it nearly went the full depth of the drywall and was over a foot wide. This one was significantly more challenging. I at first thought we’d need to cut it out and put in new drywall. We also looked into patch kits that use a mesh backing. However, I couldn’t see how I’d be able to get either of these fixes level enough to tile. So I decided to at least attempt to see if I could spackle it. I bought a big tub of spackle and hurled it into the crater and used nearly the whole container in one go. The next morning I realized the weight of the spackle caused it to separate from the drywall and sag down and I very easily removed the whole lot of it which really hadn’t adhered and was still wet. I realized I needed to go thin layers and take my time. It’s been a process… I’ve lost count of how many layers of spackle I’ve used but I’m guess I’m in the teens somewhere. But eventually it became level enough. if you can identify where your backsplash was glued, pry at these points. Our next problem was behind the stove. We have a slide in range which means our stove is flat and there is a bit of counter surface behind the oven. Our sneaky counter installers had skipped putting down a counter behind the oven and instead installed the 4 inch granite backsplash on top of nothing at all behind the stove. Once removed, there was a sizeable 1 inch gap behind the back of the oven. You could just imagine god knows what collecting back there and you could also see the gap from the sides which didn’t look nice. Lucky for us my dad had a saw he could use to cut some granite. We got him to cut some of the backsplash granite down to a 30 inch piece. He installed it flush with the counter over a wooden plank to help take the weight of the granite. We used a good amount of liquid nails to glue the granite on because that’s what we had on hand. This solution gets an A+. It wasn’t easy, but it looks great. I figured the more we could remove, the easier it would be for us. We have some small bits of trim pieces around our cabinets that hide the gap between the cabinet and the wall. It was installed with a few finishing nails and easily popped off when I stuck a butter knife under it and turned. The hard part was ripping the nails out of the cabinet. Eric used a set of vise grips and used his man guns. Removing the vent hood was quite a bit trickier. The stacked portion on top was easy to remove and then we made the mistake of unscrewing the bolts into the wall before unwiring it. Which meant that I then had to hold the hood while Eric unwired it. And we also did not turn off the correct breaker for the hood and Eric got a nice shock when he did finally get to the wiring. When we unscrewed the bolts they fell back into the drywall because they had an anchor on them. This was fine except the bit of drywall we’d need to go into to anchor them when replacing the hood was gone. We decided to remove the drywall enough to slip a board in between the studs. We will then hopefully be able to bolt directly into this plank, instead of using drywall anchors. I’m crossing my fingers on this one.